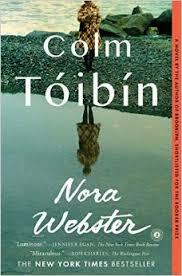 Compellingly set in a rural area southwest of Dublin, Ireland between 1969 and 1972, Toibin’s novel is full of interconnected families and lives. This is a wonderfully nuanced, character-driven story which unfolds slowly, subtly revealing a tale of courage, healing and change. And there is considerable of change of many kinds from minor personal adjustments to large scale political upheavals. Nora Webster’s husband, Maurice a schoolteacher with moderately liberal politics, has died and been buried and Nora is left to try to live her life as the sole support of their four children, two older girls and two younger sons. She has no idea how to go about this and she is physically and emotionally exhausted having stayed with her husband at the inadequate local hospital through his last several weeks of excruciating pain. Quite simply, Nora is lost and unable to interact or really connect with others, even family members, appropriately. She tries new things like getting her hair colored and visiting relatives, even watching television movies with her boys. She’s also financially broke and even after selling their small vacation home has to get a low-paying office job – a kind of mercy hire at a company she had worked for twenty years prior. Arranging her life will take time and it will not be painless. Sister Catherine – Gibney – sister of William? a few other friends – Lily Devereaus, Larry Kearney. Thomas Gibney – manager at Gibney’s – son/father/brother (?) of William? William Gibney, Sr. – father of Thomas?